July 10, 2018 7:00 A.M.
Also present from the City were Rich Simon – Director of Public Works, Dustin Bedore – Director of Electric Utilities, Joni Showalter – Police Chief, Suzanne McClure – Economic Development Director, Brian James – Fire Chief, Mary Volk – City Clerk, and Andrew Finzen – City Manager. Also present from the County were Mike Cochran and Doug Meissinger from Rural Fire Board, Crissy Livengood – Communication Director and Ashley Mannis – County Clerk. Cardboard Recycling – Dave Daniels, Sherman County representative on Southeast and East Central Recycling board stated, when we started began recycling in Sherman County there was an agreement between City and County. The City bought the containers and maintain premises while the County pays annual fee, based on census. The current containers are used to recycle glass, aluminum cans and newspaper. 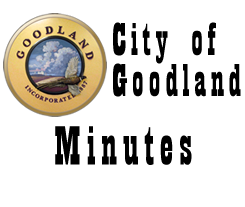 Goodland is one of the highest users of the containers. Everything we can keep out of landfill keeps us from having to dig another hole. About 75% of the product that goes into the landfill is cardboard. Kanorado also has containers. We are the only Kansas County in the organization. I recommend we look at starting to recycle cardboard. As of last quarter they were not looking at increasing price. The existing four cubic yard bins are the City’s but you would have to buy another container for cardboard which are eight cubic yards. The cost for the containers are $2,247 each in lots of ten or $2,124 in lots of twenty containers. County Chairman Enfield asked, would we buy three containers to have one at each location. Dave stated, the containers must be bought in lots of ten so you may have to contact another community to get the ten. I feel you need two cardboard containers at each location since newspaper fills up fast. At one time there was an interlocal agreement. The cost is $2 per person annually, which has not changed since containers were purchased. Previously we could not find anyone to haul to cardboard, now they will pick it up. If it is bailed it can sit outside a year. County Commissioner Topliff stated, I talked to Colby about setting up operation at landfill but it is a losing proposition by time set it up. Commissioner Fairbanks asked, what about recycling plastic. Dave stated, Southeast and East Central Recycling does not recycle plastic at this time because of the volume needed to get a bail. Their funding to operate is through the State of Colorado so we are able to keep costs low. Mayor Linin stated, it seems like a good program. Commissioner Fairbanks stated, I appreciate your hard work on committee over years, it’s a good program. Dave stated, Goodland has the cleanest recyclables, they like receiving our loads. I would like to see a little information in with the City bills or newspaper to educate public. Fire Departments – County Chairman Enfield stated, Charles Mosier, County Attorney, could not be present today but with taxing entities the way they are he indicated we cannot share in cost of equipment. Commissioner Garcia stated, the idea we are approaching is cost share of equipment rather than consolidation. Brian stated, since equipment is getting more expensive and can use equipment that serves both entities, I would like to address a cost share for new equipment. We are supposed to be on ten year rotation for equipment, budgets are getting tight and not putting away adequate money to fund new equipment. Currently to replace Unit 1 it will cost $ 350,000 for the engine without equipment. The idea is the City and County share in cost of equipment and maintenance since it can be used both in City and County. County Chairman Enfield stated, I understand what you are asking but would like to ask attorney’s for advice to make sure it is possible. County Commissioner Topliff stated, there were three Fire Districts in County that combined in 1967 by signing a contract which formed Fire District 1,that does not include the city, and falls completely under County Commission. To change contract today, you need all three entities to agree or break off and take their money with them. Brian stated, I am looking at savings for tax payers and trying to find a way to work best for the City and County. There are areas you can amend the contract. We need to look at areas where Sherman County can save money as a whole. County Chairman Enfield stated, I would like to have Charles and Jake at next meeting to discuss and ensure we do it right. Mayor Linin stated, it is about what fits in budget, saves money and protects our citizens. Andrew stated, the City and County need to agree in principal with issue then look at logistics. Economic Development – Andrew stated, this is on agenda to discuss collectively the City’s desire to have County come back to the table to help fund Economic Development. This is driven by the County not paying annual fees to NW Kansas Planning and Development Commission. County Commissioner Topliff asked, is the City aware they sold apartments on Cattletrail for less than what they were worth and are building houses around communities that are losing money? County Chairman Enfield stated, I decided it was a waste of my time to be on the board and have a concern with houses being built when they are not taking bids from local contractors. He only uses one local business, Rasure Lumber. I do not understand what we are getting out of program for $10,000. Suzanne asked, why were we not told about this information when we asked? County Chairman Enfield stated, their website does not have Sherman County on it. As a tax payer do you want us to pay dues to an entity that appears to be upside down? What have they brought to the tax role in our community? They are applicable to Section 8 rules so we do not receive property tax income from their properties. Suzanne stated, they are using the college for a learning experience but progress is slow. Mayor Linin stated, Ben Schears at NW Technical College has claimed some responsibility because they are big projects for their program. County Chairman Enfield stated, we will pay half if the City is willing to pay half. In other communities the annual cost is split. Andrew stated, I would ask whether economic development in the other communities is funded by both entities. Right now the City pays 100% for Economic Development. County Chairman Enfield stated, when Randy Rhabe was at our meeting he indicated he was over built on properties in many communities. I have been told we are not the first county to withdraw. County Commissioner Blake stated, their board needs to do an internal investigation. County Chairman Enfield stated, next time there is a meeting we need to go and ask questions. The micro loans they have done are bad. Vice-Mayor Brumbaugh stated, there are concerns if we can write grants and get money but he cannot follow through on grants written that we have paid for. Mayor Linin stated, I would like to partner with the County for Economic Development as the City has bore the burden the last several years. It is more than just the financial side, it is for the County and that we are all working together. County Commissioner Blake stated, we need to look at the big picture, you have offered an olive branch to CVB for an office, have they moved out there? Statute states we do not need a board. What if we had one director shared by City and County to take care of Economic Development and CVB that answers to both commissions. Mayor Linin stated, that is how it was organized in the past but people found out the Chamber only had a little money, unlike CVB and Economic Development so they split it up. I agree I would like to see it all together. Suzanne asked, can County rewrite contract to allow that to happen and the director answer to both City and County Commissions? Mayor Linin stated, all money is tax dollars for Economic Development and CVB is all bed tax so makes sense governing bodies would administer the departments. Andrew stated, we have the building and need an employee to man building, which is tourism. Commissioner Garcia stated, what do we have to do to proceed, I agree let’s move forward. County Commissioner Blake stated, statute states if we have board, have to have ten members, with six of ten members from motels. I feel we are losing accountability. Suzanne stated, when Economic Development has a project I feel it is important for County to have input on the project and incentives. We need everyone to work together to get direction. Andrew stated, Economic Development grows Sherman County, not just Goodland; we need to be pulling ideas and resources. Vice-Mayor Brumbaugh stated, fortunately budgets are driving discussions with duplication of services in the budgets. We do not need another board to work through. County Commissioner Topliff stated, let’s look into the big picture of combining Law Enforcement, Fire and EMS. Commissioner Garcia stated, it is a good idea but County Chairman Enfield brought up the issue with two taxing entities, we need legal input so do not tax citizens more. We cannot just have conversation but be actively involved in getting it done to be progressive. County Commissioner Blake stated, the City and County Attorney’s need to start discussions to get us started. Demolition Fees – Mayor Linin stated, we are making a push to handle more unfit structures in City. They are being created faster than we can demolish them. One of our contractor’s asked if we could have something done with landfill fees because they are half the bid. We have the problem that contractors want to save some of material which creates piles outside of town. We would like to go to our contractor with lower or waived fees for demolition to get ahead. County Chairman Enfield stated, we have been doing budget. The cost to fund landfill is $95 per household but many houses are abandoned and our equipment is old and needs replaced. We need to increase fees to meet our budget, so it would be difficult to cut fees when we cannot meet budget. Mayor Linin stated, we appreciate anything that can be done because taxpayers end up paying for demolition since property owner does not pay demolition bill. County Commissioner Blake stated, we have to look to see how it will work in budget. County Chairman Enfield stated, we are crushing concrete at the landfill now. Rich stated, we are encouraging contractors to get concrete crushed if taken to landfill. County Commissioner Blake asked, can the City and County justify sharing a crusher? Rich stated, would have to look at costs, I feel we would need to look at something on end of excavator. Andrew stated, I commend County for assistance during cleanup week and assistance with crushing concrete. Tax Sales – Mayor Linin stated, we want to discuss a tax sale for properties delinquent on property tax. We have had issues where property comes up for demolition but property was not on tax sale. Vice-Mayor Brumbaugh stated, the last couple of properties presented as unfit structures had five years of back taxes. People are interested in purchasing the properties so if they could have been sold at a tax sale to be rehabilitated, it may have solved some problems. Ashley stated, properties must be delinquent in taxes three years to go to tax sale; once qualify then property owners have to pay total delinquent taxes. Until the property qualifies, they can make payments on taxes to eliminate possibility of going to tax sale. Right now we do not have enough properties with delinquent taxes to justify sale. County Chairman Enfield stated, it is expensive to do a tax sale. Mayor Linin asked, if you do not have enough properties to justify cost, then you wait another year? Ashley stated, yes. County Commissioner Topliff stated, Dane Hansen has money to clean up properties if owned by governing entity, so they recommend signing property over to governmental entity to save tax liability, if not then property goes to condemnation. Andrew stated, some communities have a land bank setup for that purpose. Problem is property we need to acquire are non-responsive property owners. Vice-Mayor Brumbaugh stated, three years is a long time. Dispatch Center – Andrew stated, we are touching base on status of center. County Chairman Enfield stated, we have been looking at grants to fund operations. Big problem is location and current working conditions, it is hard to get people to work. Andrew stated, I have been working with a contractor to get an estimate for a full expansion of dispatch but have had a few hang ups getting numbers. Preliminary estimate to expand and provide accommodations is around $150,000, on high end. I asked them to bid conservatively to ensure their numbers were not on the table when we bid project. Mayor Linin asked, is that gutting and starting from scratch? Andrew stated, yes, starting from scratch to add TV room, shower, and office space. Looking at east side of basement, we already have a conference room. Crissy stated, my one big concern is water in basement. A new building would be a crisis center with a meeting room and ISO center. Ryan Murray Emergency Management Director stated, if you can address water in basement it would be good because we cannot have dispatch center go down. County Commissioner Blake stated, there is exterior stuff that can be done on building for water issues. County Commissioner Topliff stated, FEMA would like center to be in tornado shelter. If we are going to spend money on a facility, we want to plan for the future. A new structure will cost between $600,000 to $1,000,000. Rich stated, it was addressed a few years ago that if something happened with our facility the weather service will have you up and running. Ryan stated, the weather service is a location Emergency Management can go but dispatch center is a different issue. County Commissioner Topliff stated, a different structure addresses terrorism. Ryan stated, you can move Emergency Management operation to another location, dispatch center cannot work that way. Crissy stated, if we are in our own location we can add seats when handling a bad situation. USDA can take care of a small portion but still getting random data together. Ryan stated, FEMA does not set standard for a dispatch center. They only require a tornado shelter if they fund the project. Crissy stated, yes it is up to us where we go. Andrew stated, so there is no requirement the center be located in a tornado shelter. Crissy stated, you have worked to better other agencies I feel it is time to raise my hand. Commissioner Fairbanks stated, most of the cost is for the tornado shelter. Crissy stated, yes, I continue working on grants but money keeps getting diverted with other disasters. Mayor Linin stated, I feel the basement is a good location and need to get to work on making it a better work space. Spending money on a new facility does not seem feasible. Commissioner Fairbanks stated, I agree, the new building may be down the road. Andrew stated, if we remodel facility I would think the City would want an agreement the center would remain in location for a certain time period. Bus Stop – Andrew stated, this is a community concern with the type of people the bus brings in and the service we have to provide when they are here. It has been mentioned that Colby and Burlington passed an Ordinance to keep the bus out of their town, this is not the case. Colby and Burlington had an incident and business owners said they are not allowed to stop in community. This is not a huge law enforcement issue but it is for hospital services. Vice-Mayor Brumbaugh stated, I have been contacted by a business owner that would like to be involved in conversation as he is not in favor of bus stopping. Andrew stated, I have had calls from other business owners that the increase in sales does not offset the shop lifting and clientele. Vice-Mayor Brumbaugh stated, there are a lot of resources spent from hospital standpoint because they give incorrect names and information. Andrew stated, I am not sure there is anything we can do to eliminate service in community. I have not talked to anyone at Greyhound at this point, trying to chart a direction to take. Mayor Linin stated, going back to what Chris Smolik from hospital said, if Greyhound would set up a ticket station in Goodland he would be in favor of them stopping. Commissioner Schields stated, Sheriff has a problem because they have to bear the cost if they have to transfer them to Larned. Joni stated, the number of riders with mental issues coming off bus is not high. City police provides manpower at hospital before any transport while sheriff transports individual. We have even talked to Greyhound and they have allowed us to put people on bus to buy ticket at next station. We deal with more people locally on mental issues than from the bus. I do not have shop lifting numbers because they are not reported. Andrew stated, it would be difficult to require a ticket station in an ordinance because a tour bus that wants to stop also has to be addressed? Neighborhood Revitalization Plan (NRP) – Andrew stated, the current plan expires April 30, 2019 and Attorney General has ninety day review process so we want to resolve any changes needed before January 30, 2019. If everyone agrees that no changes are required, we just need to update dates in existing agreement. Each entity has to have a public hearing for plan. Consensus of City and County Commission is that it should not take much time to update information and approve plan for Attorney General to review. Scheduling Another Meeting – Consensus of City and County Commission is to schedule next meeting September 11, 2018 at 7:00 a.m. at Wolak Building. ADJOURNMENT WAS HAD ON A MOTION Commissioner Garcia seconded by Vice-Mayor Brumbaugh. Motion carried by unanimous VOTE, meeting Adjourned at 8:50 a.m.